By their personal timelines it was nearly Christmas for Wyn and Stella. They debated how to spend it. The Doctor suggested several exotic places where Christmas was still celebrated by Human colonisers of space, but they both felt that Earth was the only genuine place to do it. And he knew exactly where on Earth they could go. Stella agreed with her sister on that point. Jamie looked at The Doctor. Wyn and Stella just accepted that as the sort of completely irrelevant thing The Doctor often said, but Jamie was doubtful, still. “I’d better remember to do that tomorrow, then,” The Doctor said “Otherwise it’ll cause a minor paradox.” He stopped by a gate and looked at the bungalow he had visited before. It now had a new extension that looked like a couple of extra bedrooms and a second bathroom. Susan and Miche were continuing to live with her mum and stepfather. The Doctor hadn’t actually attended the double wedding yet, though he knew he was in the group photos. The date was in his To Do list for the future. Something to catch up on after his year with Stella and Wyn was over. Jamie was dressed today in an elegant, feminine pair of slacks and blouse with a plaid wrap to keep her warm. Wyn was in a skirt suit. They looked like two youngish, fortyish women with good taste in clothes, even though the taste owed a lot to the TARDIS wardrobe. “Thanks, Doctor,” Wyn told him, happily. As it happened, it would have been too late for Jamie to switch to her male form. The front door of the bungalow opened and two women ran down the path, both calling out to The Doctor. Susan reached him first and he embraced her fondly. “And she looks it,” The Doctor replied diplomatically. He was rewarded with a broad smile from Collette, who had a lot of Jackie Tyler in her, he always thought. Well, perhaps a little quicker on the uptake than Jackie, he noted. As she invited everyone into the drawing room she noticed the way Jamie and Wyn were holding hands and made a quick calculation of the sleeping arrangements. “That he is,” The Doctor assured her. “And the sofa will do me just fine, Collette.” He smiled as Miche came to greet him as an old friend. The young Forêtean seemed to have settled down to life as an honorary Irishman. He looked comfortable in slacks and a County Mayo GAA shirt. Both were a long way from the homespun clothes he used to wear on his native planet. He asked The Doctor about Forêt, of course. Had he been back there? Was everyone well? The Doctor didn’t tell him he had spent several decades there, watching his children and grandchildren grow up, watching Dominique grow old and die in his arms at the end of a good, satisfying life. Though the memories of that time warmed him when he let himself remember he didn’t really talk to anyone about it. He assured Miche that everyone was well and Forêt was at peace, and that was enough for him. “You’re welcome,” he told him. Then he looked around the room, taking in the conversations going on about him. Stella and Collette seemed to be getting on well. Jamie and Wyn were sitting at the back of the room with Mrs Whelan, Sean’s elderly mother, talking amiably. He got up and went to join them. Mrs Whelan was in her late 60s, but still a bright, quick thinking woman. She sized The Doctor up right away. “I had one,” he said. He didn’t add any more, but the tone of his voice said it all, and he was right about Mrs Whelan. She understood what was unsaid. “My husband passed away when Sean was a boy,” she said, and he knew from that reply that she recognised in his young face one who had outlived the one he loved, just as she had. A kindred spirit. “I quite agree,” The Doctor told her. That had always been the principle by which he celebrated Christmas, despite being born on a planet two hundred and fifty million light years from the place where Christmas began with a baby born into a less exalted lifestyle than his own. It WAS a time for being thankful for the comfort of home, family, friends, companionship, whichever of those things he had at any one time. On that basis he remembered his earliest Christmases. 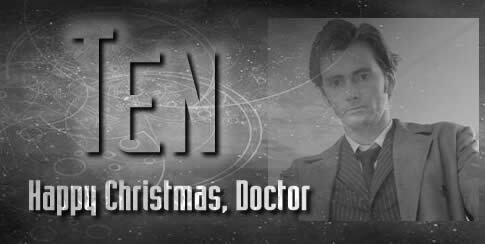 His home had been the only one on Gallifrey where Christmas was celebrated. His Human mother had brought the tradition to them and his Time Lord father had kept it up in her honour. Later, when he spent more time with Humans and less with his own people, he came to value Christmas all over again. He had some very fond memories of years gone by. Yes, those times in the 1970s when Earth was his enforced home. U.N.I.T. Christmas parties with Jo and the Brigadier. Good times that made his Earth prison more bearable. He often wondered whether those who ‘condemned’ him were disappointed that he found happiness in his exile or whether that was part of their plan in some way, a lesson in humility by making him live among an inferior species that managed to teach him so much. A later Christmas crossed his mind. The only one he ever spent with Rose. It had been far from a perfect time. He had been half-fried by his regeneration, weary from fighting the Sycorax for the freedom of the entire Human race, his emotions were all over the place. But the kindness of friends, the love of a good woman, had pulled him through. Even the turkey hadn’t been bad by Jackie’s standards. That was one of the good memories. But it was tainted by the remembrance that by the next Christmas Rose was gone. They all were. Rose, Mickey and Jackie, and that warm friendship and love would never come again. That following Christmas he had spent his time battling another alien invader of Earth in the company of a loud, but surprisingly warm and understanding Human called Donna who invited him to have Christmas dinner with her and her parents. But it had felt too difficult that time. He was too world weary. He had run away from that domestic arrangement. It wasn’t long after that, of course, that his life had taken a new and strange twist even for him, and he and his TARDIS had fallen through that rip in reality that had brought him to this universe, where strictly speaking he didn’t belong, but where he had discovered so many places he could call home for a little while at least. There he had caught up again with Jo, and met Wyn, and later Susan, and where Dominique had given him a respite from the cares of the universe and a life he never dreamt possible. Then Wyn and Stella had come back into his life and Christmas with Susan and Miche, a chance to catch up with old friends, had seemed like something he wanted to do. Yes, despite the setbacks and the sorrows he had blessings he could count. “So how do they celebrate Christmas on your planet then, Doctor?” Mrs Whelan asked, and that took him by surprise. But Sean and Collette knew what he was. They knew that Miche came from another world, and at some point they must have told her that at least one of their Christmas visitors wasn’t from Earth. “Gratefully,” he answered, his mind flicking back to his thoughts only just a few moments before. He hoped he wasn’t required to elaborate. He didn’t want to burden them all with the fact that his home world was no more, and he didn’t like lying about it. But it sufficed. Mrs Whelan was pleased to think that the Human ideal of peace and goodwill to all men extended to men who weren’t born on planet Earth. The Doctor noticed that Sean could recite the inventory soundlessly as she spoke. Obviously this was a story that had been told more than once, and probably at the slightest pretext. “It’s so much nicer when I get them without asking,” The Doctor commented. Mrs Whelan approved of that answer. She kept him by her through the afternoon, talking about Sean’s childhood and life as a widow in the West of Ireland in the late 1970s, when recession bit down on everyone and emigration decimated the youth of the rural towns and villages, leaving a population that was growing older and wondering sadly about the future. Later, when they were getting ready to spend the evening at a Christmas Eve Social at the Church Hall, Sean apologised for the way his mother had monopolised his attention. So often he had to hide who he was, pretend to be someone or something else, John Smith with a fake identity on his psychic paper. But the whole family, most of the PARISH knew him for what he was, an alien who came to live among them from time to time and wished them no harm. Not having to pretend was good. It felt like a Christmas present by itself. So once he had changed into a suit and tie that looked as if it HAD seen an iron and would pass Mrs Whelan’s critical eye, he brought them all out, not to Sean’s people carrier, but to the TARDIS. He saw Mrs Whelan and Susan safely on the sofa, protected by a couple of anti-grav cushions in case of a bumpy landing. Collette sat with them. The rest, Sean and Miche and his usual crew, Wyn, Stella and Jamie, gathered around the console and watched as he piloted the TARDIS in a slow orbit around the Earth. For those who had never been in space before it was the trip of a lifetime. Even for his more experienced friends it was a treat; an opportunity to remind themselves how beautiful and unique their homeworld was, how precious it was, and how they had to look after it. Because even though there were a billion other worlds out there, there was only one Earth. “Yes, he thought. He could. But he wouldn’t. 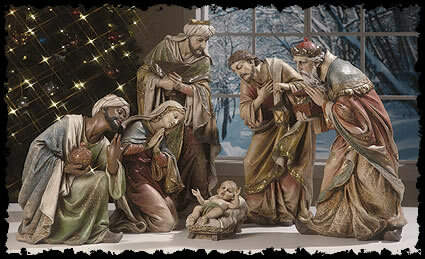 Because miracle as it may have been, the dawn of a new epoch for mankind, as beautiful and romantic as the Christmas cards and china nativity tableaux on the sideboard made it look, The Doctor knew it was nothing of the sort. As a doctor, a man who knew about childbirth, he knew that the reality of it all was still a young woman in pain and distress, in what was hardly the best place for it all to happen, with an uncertain future ahead for her and her child. And the last thing she needed was an audience! “Oh, rabbits!” Collette exclaimed, breaking into his thoughts and bringing a smile to his lips as he remembered that the only other person he knew who said ‘rabbits’ instead of swearing was his old friend, Tegan. Somebody else he ought to phone and wish a happy Christmas, he thought. Then he listened to what had upset Collette so much. Sean and Collette had lit the candle together after tea when it got dark. Mrs Whelan watched approvingly as her English daughter in law observed their Irish tradition. The Doctor had surprised them all when he told his companions all about the West of Ireland tradition of putting a candle in the window on Christmas Eve to light the way for travellers. As an eternal traveller himself he thought it a nice idea in itself. But the tradition went on to say that, if a house was especially favoured, the Holy Family would stop off on Their journey and rest a while before leaving a blessing upon the house that offered such hospitality. It was a little at odds with the more realistic view of events that had crossed his mind before, but all the same he thought it a nice, harmless tradition. The candle left alight in the window while they were out was rather less harmless. Wyn commented that they should have left K9 to watch over the place, but he had come along for the ride with them. Collette fretted and didn’t enjoy the view as the TARDIS passed over the Himalayas, over China and Japan, Australia and New Zealand, and over the blue Pacific to the Americas and back across the Atlantic into the moonlit Christmas Eve. They didn’t see a burning bungalow lighting their way as they approached the coast of County Mayo, but even so Collette was insistent that that had to stop off home. “No need to stop,” The Doctor said with a grin. He put the TARDIS into hover mode above the Whelan home and then did something on the console. “Sorted,” he said. “What did you do?” Collette asked. “Yes, we are,” The Doctor replied and he put the TARDIS into hover mode, flying forty feet above the moonlit Killala Bay towards the Parish Hall, brightly lit for Christmas. The Doctor was welcomed as an old friend by many of the people there - particularly the ones whose lives he had saved a few years ago, the ten lost souls from 1798 for whom causality had made a space in the early twenty-first century. They all looked very different now. They had learnt to speak English, they were wearing modern clothes. They had jobs and were contributing in their various ways to the community they were living in. He talked to them for a while, and was satisfied to know they were doing well. Then, as Sean had predicted, Mrs Whelan claimed his attention and steered him towards her elderly friends in the corner. He drank tea with them and listened to their talk about the old days when the hall had been a ballroom on Friday nights with a band playing and the dancing going on till midnight and walking home afterwards with their sweethearts. That was how Nora Sweeney had taken up with Paddy Whelan and eventually become Mrs Whelan. Even then, before Sean was born, she liked nothing better than to come out dancing. The children of the parish got on with The Doctor, too. It probably had a little bit to do with the fact that his perfectly neat suit had pockets that had a bottomless supply of Christmas chocolates, but it might have been more. Something about his disarming grin seemed to tell the children that this adult was different to the others, older and wiser, yet still closer to them in spirit than most people ever were. “Jesus, Father Christmas and The Doctor!” Wyn said with a laugh as she watched him. “The only three men that ‘don’t talk to strangers’ doesn’t apply to.” Then as the band struck up and people started to dance, she watched him turn back to the elderly corner and ask Mrs Whelan out on the floor with him. As Jamie took her hand, surprising some of the locals and Stella found a young mechanic from Sean’s garage who had scrubbed up well in his best suit, Wyn watched The Doctor weave a more potent spell than ever. It WAS him, of course. Nobody else could have done it. If you looked casually around the room it was still 2012 and nothing had changed. But if you half closed your eyes and looked sideways, slightly, it was 1969. The clothes were different. The lights were different. There was no licensed bar, only a long trestle table where fruit drinks were a penny. People who weren’t dancing were smoking. It had been twenty years since Wyn had seen anyone smoke indoors! Mrs Whelan was a pretty young woman in a pink dress she had made herself from the latest fashions in the magazine she bought in Ballina. Around her, the people who were old in 2012, who sat in a corner talking about the old days, also looked young and they were dancing happily to the same old tunes they knew. It lasted the length of three songs, then reality snapped back. The old people smiled and said it was grand to remember how it was when they were young, and they thanked The Doctor for his little miracle before they sat back down and drank tea and talked about the good old days, safe in the knowledge that they WERE the good old days. The Doctor turned, smiling and looked to see who else needed their share of Christmas spirit reviving. He noticed Sean Whelan by the entrance with the Deacon. Both looked a little worried. “What’s up?” he asked, bounding towards them. “Just so you know, I’m not an elf, or a little helper,” Sean replied. Sean grinned and followed The Doctor out to the car park where he had left the TARDIS. He expected The Doctor was going to locate whoever had the wrapped gifts for children and bring the sack back to the hall. He was rather surprised a few minutes later to find himself in broad daylight in Grafton Street, Dublin, heading for one of the more expensive department stores. “That isn’t what I was supposed to do?” he asked guilelessly. “Why not?” Sean answered. It was possibly the strangest conversation that ever took place by the gift wrapping desk of any department store, but Sean fully understood. The Doctor was enjoying a day off from being saviour of the universe and just enjoying being Father Christmas of Killala. The Doctor turned and smiled and put a pile of parcels into Sean’s arms. He took a pile himself, and two strong young men were detailed by the manager to help the customer take his purchases to his car. The TARDIS was parked in a small, pedestrianised side street near the store. The shop assistants looked puzzled by the exterior of The Doctor’s ‘car’ and even more puzzled by the interior as they brought the piles of presents in. The Doctor employed a little Power of Suggestion that would make them forget the details later, tipped them generously for their help and wished them a Happy Christmas. They cheerfully wished him the same and went back to work, thinking of no more than the end of their shift and the start of their own Christmas. The Doctor’s face was inscrutable. The Doctor said nothing. He pulled the equivalent of the parking brake on the console and reached to open the door. Sean walked up the gangway and looked outside. The Doctor followed. The Doctor didn’t answer that. He just smiled and strode into another department store and found their food hall. Sean scoured his memory for the things that had been in that hamper all those years ago. The turkey, the ham, cranberry sauce in a little jar, cake, pudding, fruit and veg, sweets and chocolates, a bottle of brandy. A tablespoon of it had gone over the pudding and the rest had lasted a year for ‘medicinal’ purposes. Again it had needed some help from the staff to get it back to the TARDIS. Again, a handsome tip and a little Power of Suggestion was needed, and again everyone was happy. Sean was happy when the TARDIS materialised by the front door of the little cottage where he and his mother had lived back then. The same one she lived in now while he had moved out to his own place with Collette. NOW, his mum had satellite TV and a brand new bathroom. In 1979 there was just an ordinary aerial on the chimney and they didn’t even have a phone because the lines didn’t come out this far. The toilet was outdoors. Sean shuddered with remembrance of cold treks outside with the torch. They hauled the hamper up to the front door, and knocked loudly. By the time Mrs Whelan reached the door, even the displacement of air when the TARDIS dematerialised had dissipated. They didn’t see her tired, worried face break into a joyful smile as she called for her twelve year old son to help her. They didn’t need to. Sean remembered it the first time around. Back in Killala Parish Hall, the children knew two things. 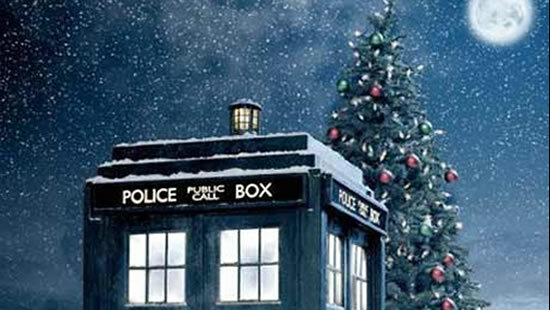 The Doctor had disappeared and it was nearly time for Father Christmas to turn up. The older and more cynical ones were wondering how somebody as thin as him was going to manage to fit into the suit. The younger ones thought he had gone to give Father Christmas a lift. Then there was a curious noise and the band stopped playing as a strange whirling breeze blew party streamers around and they found themselves sharing the stage with an old fashioned English police telephone box. 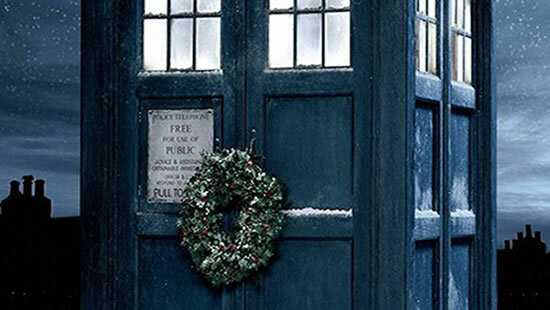 Everyone was looking at it with puzzled or expectant faces as the door opened and The Doctor stepped out, wearing a Father Christmas hat and a very wide grin. Sean stepped out with him, wearing a matching hat. And so did K9. He was wearing a hat, too, and a placard around his neck saying ‘Santa’s little helper’. Wyn couldn’t make up her mind if he was embarrassed or proud. It was hard to tell with a robot dog that had no actual variation of expression. “Father Christmas couldn’t make it,” The Doctor said, and paused theatrically so that, in true pantomime style everyone could groan out loud. “But I caught up with him up by the North Pole and got the presents for everybody!” At that he was cheered far louder than he had ever been cheered when he had saved the planet from the latest alien aggressor. He sat on the edge of the stage and K9 called out the names while he gave out the presents from the huge sack. His friends thought his head might fall off if he smiled any more widely. But he soon wasn’t the only one. Quite how he had managed to get the perfect present for every single person in the room, from the china horse for Mrs Whelan to the hand-tooled, leather backed Douai bible that the Parish Priest had coveted for a long time, nobody asked. You don’t question a miracle, even if it was a man and a robot dog wearing Santa hats. Even those who knew him and knew his TARDIS and were aware that he could pack a lot of activity into the twenty minutes he had been gone were impressed. Distributing the presents took the best part of the hour that was left before it was time to go over to the church to sing carols and get ready for Midnight Mass. The Doctor moved the TARDIS back out to the car park and then followed the crowds into the church. He wasn’t Catholic. He wasn’t even Christian. Only a fraction of his DNA was Human. But he went to Mass with his friends. He sang the carols in a soft baritone voice. He listened to the readings about that difficult childbirth a long time ago. And he figured he’d done a good job. He thought he’d take everyone home by the scenic route again. And then a quiet night on that sofa that was promised to him. And that plan worked so far as it went. Sean poured everyone a stiff brandy against the cold that had bitten even as they walked the short distance from where he had parked the TARDIS. Collette examined the Christmas candle on the drawing room windowsill. The Doctor had let the time freeze collapse before they came in and it was burning normally now. But it hadn’t burned any lower since they went out. Then the house went quiet as everyone went to bed. The Doctor took off his shoes and his suit jacket and laid himself down on the sofa. The Christmas candle still burned. He watched it as he enjoyed the quiet. He was happy. So far, at least, nothing bad had happened this Christmas. And that in itself was one of those blessings Mrs Whelan set such store by. If it kept on like this he would be perfectly content. Then something happened that made him think that he had counted his chickens a tad too early. He was still looking at the candle, and it seemed to be getting brighter. So bright even his Gallifreyan eyes watered. He sat up and looked around as the drawing room of Sean and Collette’s bungalow glowed brightly. His first thought was that it was a transmat beam and he was about to be kidnapped by some old enemy that wanted to settle a score. His hearts sank. He just wanted a quiet Christmas with his friends. He didn’t want a life and death struggle for the sake of the planet, the galaxy or the universe in general and he didn’t want to put his life on the line and risk another regeneration in the process. But a transmat would already have left him dazed and sick on some space ship floor by now. He was still sitting on the sofa in the drawing room. The sofa WAS still in the drawing room. He could see it. But at the same time, he could see another place. It was a lot like he had done with the Parish Hall, earlier, calling up the memory of the same building in 1969. But that had been easy. The building itself still had the memory of the old days in its very fabric, let alone the vivid recollections of all the old people. Besides, this wasn’t Sean and Collette’s bungalow in the old days. This was another place entirely, in another part of the world. A long way off. The people he saw there were a long way from Killala. The two people, a man and a woman dressed as a tradesman and his wife might dress something more than two thousand years or more before 2012, and in a much warmer climate, looked at him, but they clearly didn’t understand what he said. That was nothing new for The Doctor, but in this case they didn’t understand English. The man said something to him, and The Doctor smiled. Aramaic. It was one of those five billion languages he knew. But one he hadn’t used for a VERY long time. He answered them in that tongue. He looked around at the building that, he supposed, passed as a stable. It would have been dimly lit and rather squalid if something magical wasn’t going on with the light. He wondered if THEY could see the drawing room with the sofa and colour TV and hi fi, and other modern luxuries. Maybe not. But they could certainly see him. And when he stepped closer and reached to steady the woman as she sighed with tiredness and with the certain knowledge that sleep wasn’t on the agenda tonight, she was solid, she was flesh and blood. It would be. He’d delivered babies all over the universe. Mostly Human. History told him this one wasn’t going to be a huge problem. But it still came down to what he had thought yesterday afternoon - a young woman who was scared and in pain and didn’t entirely know what her future held. If he could ease the fear and the pain then that was why he called himself Doctor, even though, technically, he WASN’T that kind of doctor most of the time. When it was all over, when the woman held her baby in her arms and her husband knelt beside her and looked at the child joyfully, it DID look a little bit like the Christmas card scene, though poetic licence had a lot of work to do. The Doctor smiled happily and very proudly. He had stuck his nose into quite a few key moments of Earth history, the Great Fire of London, Nero burning Rome, the Gunfight at the OK Corral, Newton discovering gravity, with a bit of help from him, Ben Franklyn harnessing electricity. But this was the historical event that topped the lot. The new mother was trying to thank him, and telling him that he deserved a reward. His mind, for some reason, went back to the time when Brother Lassar, the leader of the Krillitane, had played devil’s advocate with him and tried to tempt him with promises of his world, his people restored and the woman he loved by his side forever. Things he wanted more than anything else. But he had resisted that temptation. Because to accept those gifts from the forces of darkness would have cost him his soul. Right now, the forces of light were offering him a reward. And he could have asked for the same, for his people, his world, restored, for the woman he loved by his side. Yes, he could have asked. And he was sure it would have been granted. The woman smiled and nodded. The Doctor smiled, too. He stood back as the bright light that had enveloped them all began to recede. Before he found himself standing in Sean and Collette’s drawing room with the light of a Christmas candle throwing dancing shadows into the darkness, he thought that the Mother and Child themselves were the source of the greater light. He looked out of the window. The moonlit night had turned in the past few hours into a clouded over one and the clouds carried snow. He smiled. He had planned one more trick in the morning. A bit of atmospheric excitation to give them all a white Christmas. But he didn’t need to. The snow started falling as he watched. He turned from the window. He laid himself back down on the sofa and watched the snow that stuck on the glass glitter in the candlelight. Ok, something strange HAD happened this Christmas. But it was nothing he couldn’t handle. In a few hours he could enjoy a happy, ordinary Christmas day with his friends. He was a happy Doctor having a happy, happy Christmas.